It’s easy to record dividends, capital gains, and other goodies in Quicken 2012. Any time you receive investment income, click the Enter Transactions button and choose Inc – Income (Div, Int, Etc.) in the Enter Transaction drop-down list box. 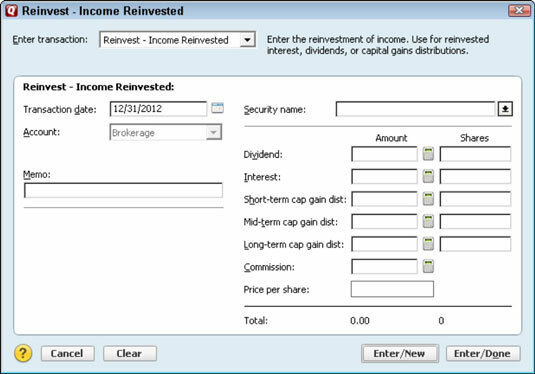 When Quicken displays the dialog box used to record income, use the Security Name drop-down list box to confirm the stock, bond, or mutual fund producing income, and then use the Dividend, Interest, Short-Term Cap Gain Dist, Mid-Term Cap Gain Dist, and Long-Term Cap Gain Dist text boxes to record the amount and type of income. Note: You use the Transfer Account drop-down list box to identify the account into which income amounts are deposited when you don’t use the investment account’s regular cash account. To record dividends, capital gains, and other income when you reinvest the money you receive, click the Enter Transaction button and choose Income Reinvested in the Enter Transaction drop-down list box. When Quicken displays the dialog box, describe the amounts received and how you’ve reinvested.